Tanaquil Le Clercq was one of the greatest dancers of her generation until her career was cut short. 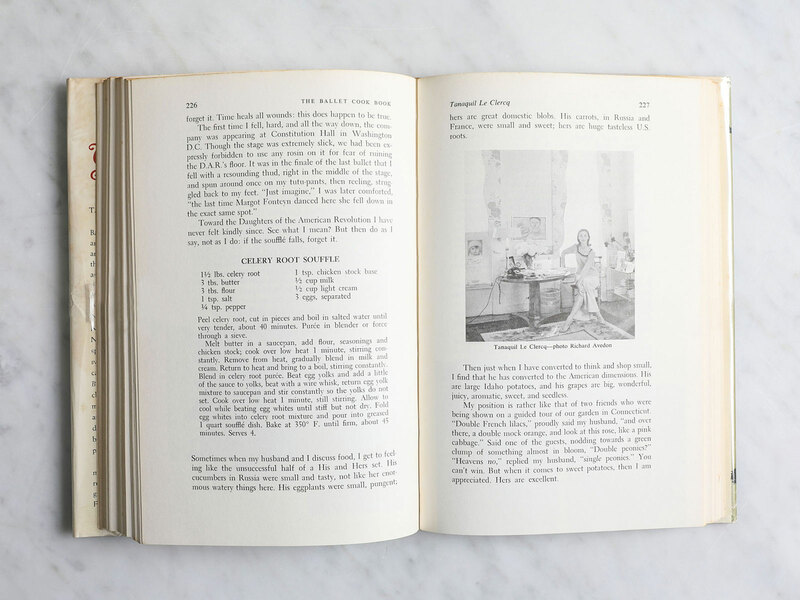 50 years ago, she published a cookbook that helped her stay connected to her roots. 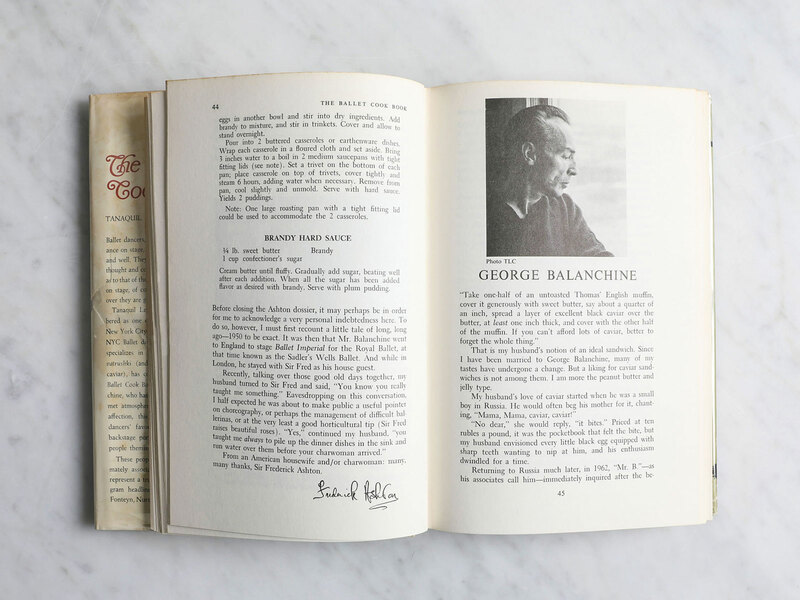 George Balanchine, the co-founder of the New York City Ballet and the perhaps the best known, and most talented dance choreographer to ever live, was, perhaps surprisingly, a legendary dinner party host. An immigrant from Russia, Balanchine held a legendary Easter feast every year, cooking many of the dishes himself. In 1952, Balanchine married Tanaquil Le Clercq, an exceptionally talented ballerina, who had been performing since the age of five. They met when Balanchine spotted Tanny—as she was known to her friends—wandering the halls of the school. He asked her why she wasn’t in class, and she replied that she had been kicked out, probably for talking too much at the barre. By 17, she had joined his company, performing roles that he had created especially for her. She would rise to the position of principal dancer at the New York City Ballet and eventually become Balanchine’s fourth wife. Then tragedy struck: Le Clercq contracted polio while on tour in Copenhagen in 1956, and became paralyzed. At 27, her career as a dancer was over. In 1962, cooking was still just a hobby for Le Clercq, but her husband, still at the height of his career, planned to go on a three-month tour of the Soviet Union with the New York City Ballet, where he was the artistic director. He encouraged her, worried that she would become bored or despondent, to work on a project that had been slowly simmering in her mind: a collection of recipes from her famous dancer friends, which would eventually become The Ballet Cook Book, a compendium of recipes passed down to her from the most famous dancers of their time, from Allegra Kent, to Suzanne Farrell, to Robert Joffrey, and of course her husband. In fact, Le Clercq had already written a book before, about the couple’s cat, Mourka. It was a critical success and opened a literary avenue for Le Clercq to explore. She embarked on the project with her whole being, sitting with Balanchine’s assistant in her apartment, sifting through handwritten recipes sent to her from dancers all over the world, deciphering the tough-to-read handwriting and converting measurements. Instead, Le Clercq threw herself into her work. She talked with dancers over the phone, clarifying their recipes and chatting about food, sometimes having them over to her home to cook, and other times, visiting their homes to watch them cook the recipes that would eventually be shared in the book. For Le Clercq and Balanchine, their backgrounds as dancers enhanced their double life as chefs. Attention to detail, precision, single-minded focus, grace, and elegance—all characteristics of the professional chefs we admire today. And there was also “…an element of ritual,” to the way they cooked. Both dance and cooking “rely on technique and are best with, and allow for improvisation.” The creative skills that drew Le Clercq to the stage most likely fueled her desire to spend the rest of her life in the kitchen. 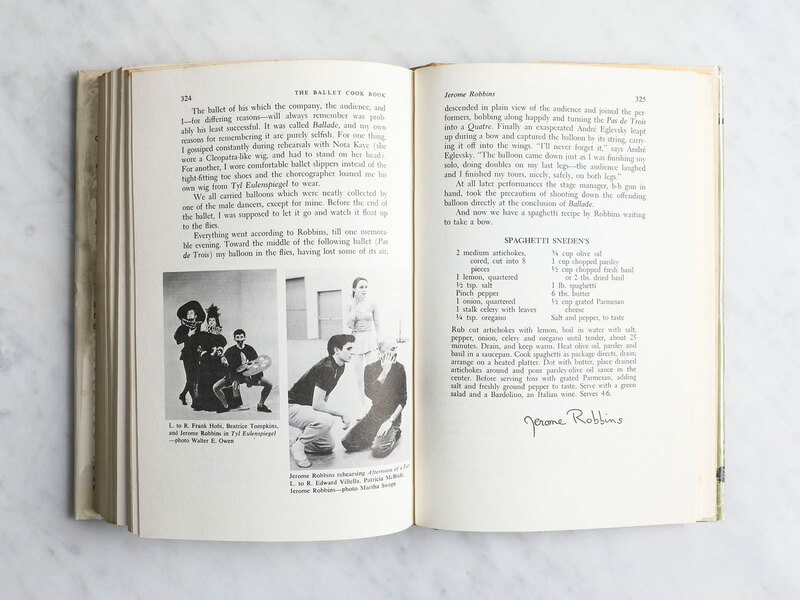 Though Balanchine certainly helped stoke his wife’s love of cooking, it’s Le Clercq who deserves the credit for crafting a book that remains one of the most detailed snapshots of a moment in the history of dance that still endures today. She even insisted that the book print only her name, once calling the publisher to admonish them for not dropping “Balanchine” from the book’s cover. 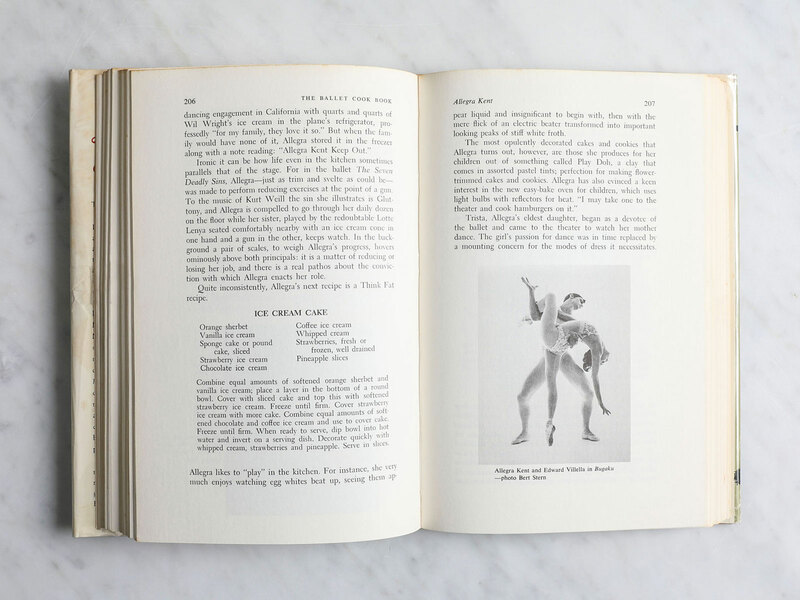 Though it’s technically a cookbook, Le Clercq includes anecdotes from the personal lives and histories of each dancer before their recipes, giving readers an intimate view of her subjects. “The stories are rarely integral to the understanding of the dishes themselves, but it’s a way of presenting them, almost like a dance partner setting the ballerina off so that she shines. It gives [the dancers] individuality and presence. 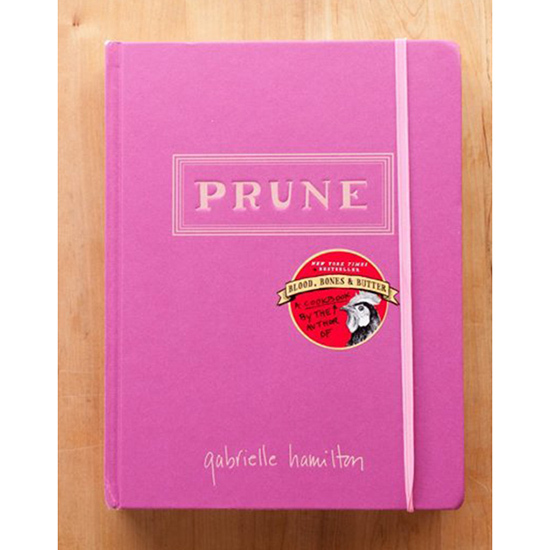 Lots of cookbooks of the day had these recipes, but none of these cookbooks had these stories,” explains Rosofsky. In honor of the 50th anniversary of the book’s publication, the Guggenheim will hold a retrospective of the cookbook with a panel and performances on November 5 and 6. Rosofsky will give a brief introduction to the book, and afterward, Allegra Kent and Jacques d’Amboise, who both have recipes featured in the book, and were present at the 1967 signing of the book at Bloomingdale’s, will be part of a panel celebrating Le Clercq’s influence. Performances of roles originated by these dancers will be interspersed throughout the panel discussion. 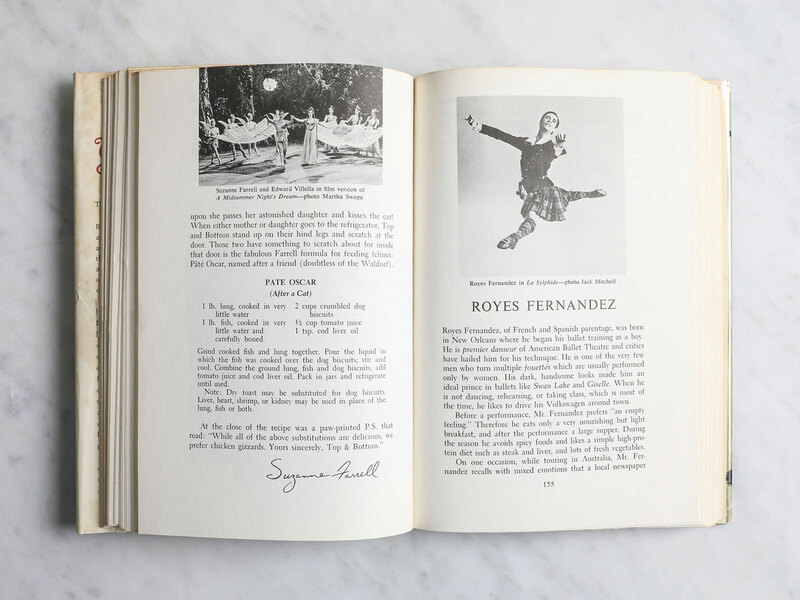 Update 10/13/17: A previous version of this article referred to the book as The Ballet Cookbook, rather than The Ballet Cook Book, and to George Balanchine as the founder of the New York City Ballet, rather than the co-founder.